The Southern California Equine Foundation (SCEF, Inc.) was conceived and developed in 1976 by a group of people who realized no organization existed whose sole function was to protect the interests and promote the welfare of the equine athlete. The organizers felt these athletes should receive the best medical care available and that the horses' handlers and caretakers needed to be educated in the methods for properly caring for them and preventing injury and disease. To accomplish this, the SCEF, a non-profit, charitable organization, became the driving force to stimulate, fund, and oversee medical research so that equine athletes could benefit from the advancements in knowledge necessary to ensure their better protection and treatment. Since its inception in 1976, the SCEF has more than fulfilled its dedicated purpose of "caring for the injured horse." It has become nationally recognized for the significant impact it has made in the fields of equine medicine and surgery. Initially, the corporation consisted of nine members with a six-person board of directors that would dictate policy and oversee the operation of the facilities, plus a hospital administrator who would direct the day-to-day functions of the SCEF equine hospital. The board members, who serve both the SCEF and the Dolly Green Research Foundation, continue to donate their time for the betterment of the equine athlete. In the beginning, assistance came from many sources. Among the most instrumental were the Horsemen's Benevolent and Protective Association, with its then Southern California President, Richard Craigo, providing legal assistance in forming the corporation; Oak Tree Racing Association, through its Board of Directors President, Clement L. Hirsch, providing substantial financial and administrative support; and Marjorie Everett and Hollywood Park providing the assistance and approval for the introduction of the first equine hospital facility on the Hollywood Park backstretch. Dr. Gregory Ferraro, one of the original organizers, was named president and hospital administrator when the first unit was opened. Joining him on the Board of Directors were trainer Jerry Fanning, vice-president; Dr. Joseph H. Cannon, secretary-treasurer; track executive Peter W. Tunney; trainer L.J. Brooks; and track executive Joseph W. Harper. Among those who provided organizational assistance were Dr. Jack Robbins and Dr. Roy Bishop. Prior to the establishment of the Dolly Green Research Foundation, the SCEF organized, founded, or was involved with several significant research projects. Its most widely known and perhaps most significant project is the study of Exercise Induced Pulmonary Hemorrhage. This study of bleeders, conducted with Dr. John Pascoe of the University of California at Davis as the principle investigator, virtually revolutionized the concept of epistaxis and respiratory disease in the racehorse. Other research projects included investigations into such problem areas as the pharyngitis complex, the analysis of bucked shins, and gastric ulcers. The SCEF's foremost accomplishment has been the building and operation of the Equine Hospital, located on the Santa Anita backstretch. Dedicated in March 1981 and constructed at a cost of $400,000, the facility became a reality through the cooperation of Santa Anita, which donated the land, and Oak Tree Racing Association, which was responsible for 80 percent of the funding. Aside from those in use at several universities, the facility was without equal. According to Dr. Ferraro, it was the hope of the foundation to provide a first-rate, research-oriented facility to conduct studies, as well as an operational facility to care for the present-day equine athlete. The Equine Hospital was an immediate success, as veterinarians from all sections of the country began using it. Many renowned veterinarians have performed surgeries in the well-equipped operating facility, developing new surgical techniques in the process. Based on the success of the hospital at Santa Anita, in 1984 SCEF built a new hospital at Hollywood Park in time for the inaugural running of the Breeders' Cup. Numerous donors provided funding for this facility, including Mrs. Everett and Dolly Green. In 1990, when Dolly Green passed away, she generously named SCEF in her will. Those monies helped the Foundation build a Nuclear Scintigraphy facility at Santa Anita in 1993. Not only do veterinarians have the existing Siemens 1,200 MA radiology unit of the hospital available to them, they now have an alternative diagnostic tool useful in finding injuries that regular x-rays cannot detect. The SCEF added a surgical C-arm fluoroscope in 2002. This equipment allows surgeons to position drills and screws precisely using real-time radiography, avoiding time-consuming x-rays during orthopedic surgeries. Veterinarians have discovered that immediate, on-site repair of fractures greatly increases the chances of a racehorse's recovery. In late 2004, the Foundation, with the help of Oak Tree Racing Association and Dolly Green Research Foundation, acquired two computed radiography systems. 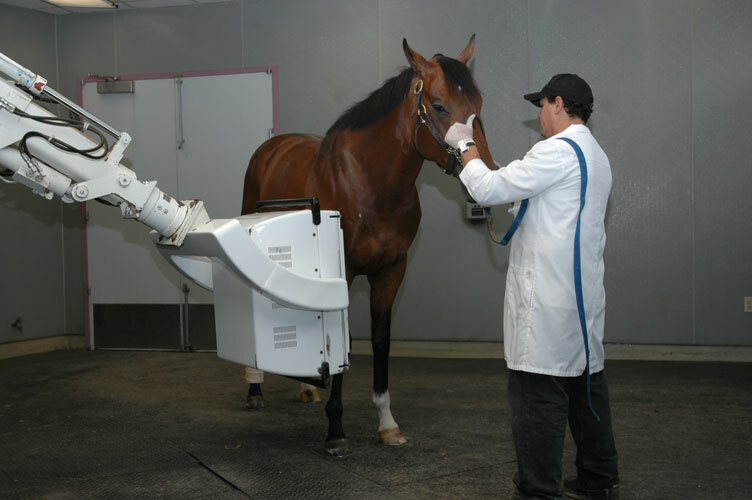 These units, installed at Hollywood Park and Santa Anita, were the first of their kind In the U.S. (human or veterinary). They feature human mammography-quality images designed by FUJI Medical Systems. Mammography-quality imaging is the high standard used in human medicine and is the finest imaging available in the radiographic community. The SCEF has, from its inception, provided such high-end radiographic quality imaging. SCEF's first "mammography quality" developing system was from Xerox, called "Xerography." When Kodak stepped to the forefront with a radiographic film/screen combination for mammography imaging, the SCEF once again led the veterinary world in converting to this progressive imaging system. When computed/digital imaging first came on the market, the SCEF waited until this type of imaging reached "mammography" imaging standard. While other units available provide good "field images," the SCEF is proud to continue to lead the veterinary community with its 50-micron Computed Radiographic Imaging system. With the closure in 2014 of Hollywood Park, the SCEF moved the lab from Hollywood Park to a trailer at Santa Anita in the summer of 2013. A surgical suite was added to the Del Mar facility in the spring of 2014. The SCEF continues to be a resource for statistical information on various equine diseases and has been instrumental in institutional investigations. Its extensive database and imaging centers help many researchers and research-finding groups organize their projects and maximize their efforts. The SCEF and racetrack veterinarians recognized the need to develop improved methods of transportation and provide immediate medical attention for a traumatized horse. Thus, they developed an equine ambulance specifically designed for the equine athlete. Under the direction of Dr. Roy Dillon, the first of these modern ambulances was introduced in the fall of 1979 following a three-year study into the requirements of such a vehicle. Dr. Dillon and John Kimzey combined their efforts to produce the present-day horse ambulance, with Oak Tree Racing Association providing funding of $35,000. The ambulance proved so successful and so popular with horsemen that a second, more sophisticated model was produced in 1981. This time a road-legal tractor was included that could move the new ambulance from track to track. Oak Tree Racing Association once again provided the $72,000 in funds for this unit. Oak Tree generously paid $80,000 for a third unit in 1997 and $51,000 for a new truck to move the ambulances in 2003. This allows the SCEF to maintain two ambulances at the track conducting live racing and one ambulance at the "off track." The SCEF also provides an ambulance for use at the Pasadena Rose Parade every New Year's Day, in the event of a horse emergency. All three equine ambulances can be lowered completely to ground level, allowing maximum ease in loading an injured horse. They incorporate a hydraulic "squeeze" apparatus to help an injured horse stand without causing further damage. A wench-driven stretcher allows for easy loading of an animal that is recumbent and unable to rise and the unit can accommodate two animals at one time. The ambulances can operate in any type of weather and on any type of track surface or condition. At the time that the first ambulance was introduced, Mr. Kimzey and Dr. Dillon developed the Kimzey Splint. The splint stabilizes a horse's limb and minimizes any damage a horse might incur during transport and before surgery is performed. The success of these two innovations is magnified by their adoption by racetracks throughout the country. Replicas of the ambulances and Kimzey Splint are now seen at leading racetracks around the world. SCEF has the distinction of being one of the few charitable organizations that has no administrative costs deducted from the gifts of the donors. Virtually 100 percent of all money donated to the SCEF for a specific project is directed to that project. 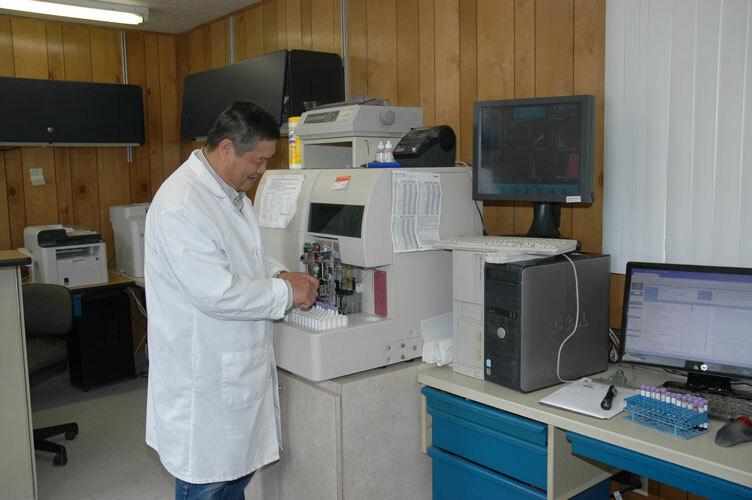 All administrative costs are covered under the budget of its diagnostic services and surgical facilities available to racetrack practitioners and other veterinarians. The SCEF has progressed and flourished because of the dedicated efforts of its founders and those who later joined. The hospital has received broad-based support throughout the racing industry from both organizations and individuals. For more information about our research, research foundations, and donations, please tour the various areas of our website. If you have further questions, please do not hesitate to contact us by email or by phone: (626) 445-7944.